Tuscany is famous not only for the beautiful landscapes but also to the excellent gastronomic products that delight our palate. 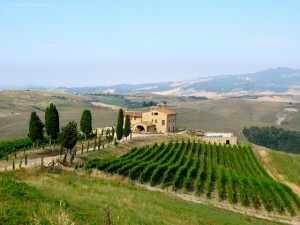 Guests of the many apartments on a farm in the province of Pisa or Siena, or those who have decided to spend their holidays in Tuscany , will have the opportunity to taste a wide variety of products. The pride of the Pisan hills, in particular of the way of Pomarance and Volterra is definitely the organic olive oil, ideal for dishes based on meat, and flavor. Also important is the production of cheese, many dairy farms in the hills near the city of Volterra and the nearby villages, allow you to sample a variety of cheeses and seasoned with truffle or spezati. The many festivals that are held in the Tuscan villages allow those who spend their holidays in Tuscany to try most of these products. 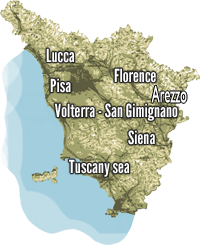 For all those staying in rooms or apartments in farmhouse with pool near Pisa or Siena usually have the opportunity to participate in dinners with typical Tuscan once a week are organized in the Farmhouse in Tuscany. The pride of the area around Pomerance the lamb, the meat can be tasted in the markets that are organized in the streets of the historic center of the country. If it is true that the summer holidays in Tuscany are appreciated by Italian and foreign, my advice is to visit Tuscany in periods other than July and August. In spring and autumn it is possible to rent a villa with pool in Tuscany at prices much lower than the high season or decide to spend a weekend in Volterra or a weekend in Lucca , visiting museums or just strolling along the streets the historic center. In addition, during periods of October and November you will taste the “new wine” with roasted chestnuts, truffles, steak with mushrooms, ravioli with meat sauce and many other dishes of the Tuscan tradition.